Green Day are getting their own standalone Rock Band game next year, featuring songs from their entire back catalogue. 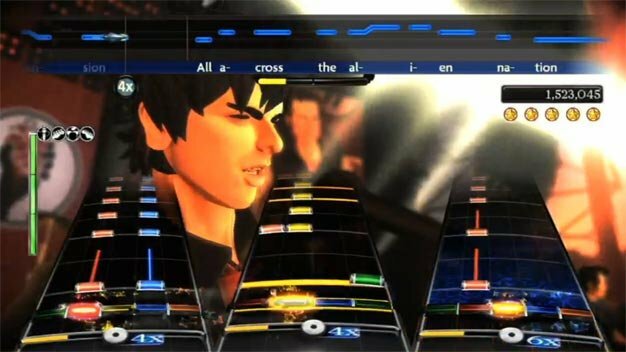 The imaginatively-titled Green Day: Rock Band was announced by Harmonix at the Spike VGAs last night, now accompanied by an official press release bringing a few more details, and will feature the likenesses of band members Billie Joe Armstrong, Mike Dirnt, and Tré Cool, as well as ‘select venues and art specific to the band’s history’. Xbox 360, PS3 and Wii owners can grab a copy in 2010. The number of tracks and specific inclusions are yet to be announced, but the songs will apparently be fully exportable, allowing Xbox and PS3 players to rock out to Green Day in Rock Band and Rock Band 2. “We’ve worked with the Rock Band team in the past year to enable our fans to play tracks from 21st Century Breakdown, and we’re excited to now be working on a game, spanning our entire career,” said Billie Joe Armstrong. In other Green Day news, a new song pack featuring three tracks from the band’s latest album, 21st Century Breakdown, will hit the Rock Band music store for all three consoles next week. The pack will be out for Xbox and Wii on Dec 15 and PS3 on Dec 17, and will include “Christian’s Inferno,” “Last of the American Girls,” and”¡Viva La Gloria!”.